"There's nothing out here but a thousand dead ends." The story of Slow Burn centers around three generations of McTeague women 'Paulina, Catalina and Trina' who all subjugate the outside world for their obsession with a handful of raw diamonds. It is never explained how Trina's (Driver) grandmother, Paulina McTeague, came about this chest of diamonds, or just what she was doing in the Mexican desert where she met her death. Her granddaughter (Trina's mother), Catalina, along with her husband, Jacob (Chris Mulkey), search for two years to find her remains and the treasure that she was carrying. From a young age, Trina had been studying the desert, learning its secrets. A "desert rat," she carries on the search, which now includes the search for her Mother, who disappeared during the original expedition, along with her father. Ford slowly fills the viewer in to the backplot with dream sequences and rememberances, which were not part of the original shooting script, but scripted, actors hired and footage shot after the principal shooting was completed. Off alone in the desert, Trina unwisely gives a ride to two men that happen upon her. Little does she know that they are bank robbers, recently escaped from a Mexican prison. What she does learn, however, is that Marcus (Spader) and Duster (Brolin) have found her great-grandmother's diamonds by accident. What ensues is an ebb and flow of greed amidst the power of a love triangle. Now held captive, Trina must attempt to escape while also regaining the diamonds. Marcus plans her demise and their escape through the desert to Texas without her aid. And Duster finds himself the only character in the film who grows a conscience. 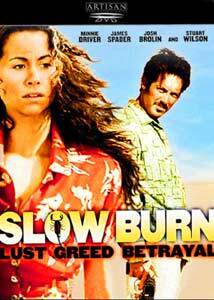 The story behind the scenes of Slow Burn is almost more interesting than the film itself. Writer/director Ford had been working on the idea for 10 years before the film was made, originally conceiving it as a 30-minute piece in the desert, after reading Frank Norris' 1899 novel, McTeague, as a film student at UCLA. Teaming up with co-writer, Roger Soffer, they eventually hooked up with Industry Entertainment, who represent the main actors here. The role of Marcus, however, was not originally intended for Spader, who was called in to replace fellow brat packer gone haywire, Robert Downey Jr. Likewise, English Shakespearian actor Stuart Wilson was literally a last minute replacement for Gabriel Byrne, who could not make the shoot due to a scheduling conflict. The story of lust and greed in the desert is not new, and the writing, direction and cinematography, while ambitious, do not rise above the crowd. This film had great unrealized potential, and I can't seem to put my finger on what exactly is missing that would serve as the yeast to make this rise above others in its class. The acting is, however, generally very good. Spader, whose bio reveals he once shoveled manure for a living, does so again throughout this film, although his bizarre accent slips at times. Likewise Driver, when she becomes agitated, has a tendency to let her British accent slide out, but she is at times powerful in her ability to emote without speaking, as she is alluring and provocative. The person I came away with a new found respect for was Josh Brolin, who portrays the graduation of Duster's morality tightly and quietly. Image Transfer Review: Considering it cost less than a million dollars to make this film, one has to be impressed with the full frame transfer by Artisan. The colors are sharp, except when intentionally drowned out by the desert sun. Scanlines, slight flecking and specks of dirt rarely detract from this mostly clean print. This won't be winning any awards, but ain't Madacy either. Audio Transfer Review: For a character-based film, the Dolby Surround 2.0 track works well. The dialogue is crisp and clear, easily understandable. The separation of the front sound stage is very good, with good directionality on pans. The rears are not overly important, but do carry some atmospheric information. Moderately above average. Extras Review: The menu system is nicely designed, although somewhat slow reacting to commands. There is a nice set of cast & crew bios and filmographies, as well as several pages of production notes. The original trailer (1.33:1, Full Frame) is also included. Other than that there are no other supplements (a director's commentary would have been nice), and Artisan continues to cut corners by not including subtitles. There are moments of high interest, but I did not get the feeling of nail-biting or intellectual suspense that the writers intended for this film. The acting holds one's interest, but I would have been disappointed had I shelled-out money at the theater. A rainy day rental.